Background: Insulinomas are the most common pancreatic neuroendocrine neoplasms. In spite of adequate pre-operative localisation, conventional surgical methods rely on intraoperative palpation. Intraoperative ultrasonography (IOUS) is said to aid in accurate localisation, decreases morbidity. Laparoscopic removal of pancreatic endocrine neoplasms is beneficial due to magnification and minimal invasion; however, in the absence of IOUS, error of judgement may lead to conversion to open surgery, thereby relying on 'palpation method' to localise the tumour. We combined laparoscopic surgical removal of insulinomas using an innovative method of 'laparoscopic finger palpation' with intraoperative blood glucose monitoring and frozen section for surgical cure. Materials and Methods: Patients were evaluated and investigated by the department of endocrinology and referred for surgical management of insulinoma. Pre-operative localisation of insulinoma was done by either contrast-enhanced computerised tomography angiogram – arterial and venous phase, or endoscopic ultrasound (EUS) or DOTATATE scan. Intraoperative localisation was done by laparoscopic dissection and 'laparoscopic finger palpation'. After enucleation, the specimen was sent for frozen section, and in the interim period, serial monitoring of blood glucose was done by the anaesthetist. Maintenance of glucose levels for more than 45 min after enucleation and confirmation of neuroendocrine tumour on frozen section was the end point of surgical procedure. Results: A total of 19 patients were subjected to laparoscopic removal of solitary insulinomas. Enucleation was performed in 16 patients successfully. In three patients, laparoscopic distal pancreatectomy was performed. Three patients had pancreatic duct leak, of which two patients responded to conservative approach and the third patient required drainage by USG-guided pigtail catheter. All patients are cured of their disease and no patient has had recurrence so far. Conclusion: Multidisciplinary approach involving laparoscopic palpation, frozen sections and intraoperative blood sugar monitoring helps laparoscopic management of solitary insulinomas without IOUS. Insulinoma is the most frequent functional pancreatic neuroendocrine tumour, leading to endogenous hyperinsulinism related hypoglycaemia. The incidence is 4 per million in a year. Surgery is the mainstay of treatment involving enucleation or distal pancreatectomy for solitary insulinoma. Palpation of hard nodule was and still is the hallmark of localisation in open surgery. Laparoscopic approach has been increasingly advocated for surgical management of pancreatic insulinomas, thus offering benefits of minimally invasive surgery. With this technique, both enucleation and distal pancreatic resection can be safely accomplished. Intraoperative ultrasonography (IOUS) has been a valuable adjunct for accurate localisation. In the absence of IOUS, localisation by palpation during laparoscopic surgery may become difficult resulting in conversion to open surgery. In the absence of the facility of IOUS at our centre, we used instrument palpation, also termed as 'laparoscopic finger palpation' method, clubbed with intraoperative blood glucose monitoring and frozen section for laparoscopic treatment of solitary insulinoma. This methodology reveals encouraging initial results. The aim of this study is to evaluate the results of laparoscopic treatment of solitary insulinoma in the absence of IOUS. This study was conducted at a tertiary care institute and a teaching centre. Patients were evaluated and investigated by the department of endocrinology and referred for surgical management of insulinoma. Pre-operative localisation of insulinomas was done by contrast enhanced computerised tomography (CECT) angiogram (arterial phase). Endoscopic ultrasound (EUS) and DOTATATE scan were done for the lesions not located by CECT. Intraoperative localisation was done by laparoscopic dissection and instrument palpation. Using dissecting forceps, palpation and feel of harder nodule amidst soft surrounding pancreas, supported by pre-operative localisation, led us to the nodule. This we termed as 'laparoscopic finger palpation'. After enucleation, dextrose infusion was replaced by normal saline, and serial levels of blood glucose were monitored at 5, 15, 30 and 45 min time interval by the anaesthesiologist. The specimen was sent for frozen section for pathological confirmation. With maintained glucose levels for more than 45 min after enucleation and frozen section confirming a neuroendocrine tumour, the surgery was deemed complete. The patients were followed up on a regular basis by the department of endocrinology. After opening the lesser sac, reaching the target site (assisted by pre-operative localisation), the next step was 'laparoscopic finger palpation'. The tip of the instrument was used for gentle palpation of the pancreas at corresponding site. This was done using a fenestrated Grasper and/or Maryland dissector. Superficial insulinoma were easy to identify. Others were localised by 'laparoscopic finger palpation'. Once accurate intraoperative localisation had been determined, surgical dissection was performed with hook electrocautery and/or ultrasonic dissection. The tumour was enucleated from normal pancreatic tissue, and specimen was retrieved in a bag [Figure 1]. The cut edge of the pancreas was approximated with 2/0 or 3/0 monofilament polydioxanone. 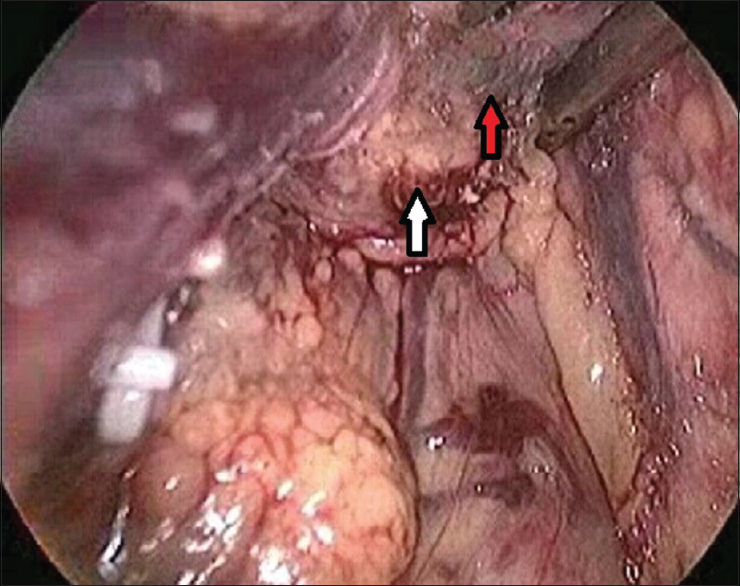 Lesions near the duct or in proximity to splenic vessels which may not amendable to enucleation were subjected to distal pancreatectomy [Figure 2] with or without splenectomy. An endoscopic stapler (endovascular cartridge) was used for pancreatic transaction, and staple line was reinforced with additional sutures. Drain was placed near the site of dissection and abdomen was closed. Postoperatively, patients were monitored for pancreatic leak by estimation of drain fluid amylase. A total of 19 patients underwent laparoscopic surgery for solitary insulinoma from March 2006 to August 2016. Age group varied from 19 to 65 years, with female-to-male ratio of 3:1. The tumours were located in the head (n = 3), body (n = 12) and tail (n = 4). The size of the tumour in these cases ranged from 0.8 to 2 cm. Sixteen patients underwent enucleation. In two patients, tumor was very close to the splenic hilum and underwent distal pancreatectomy with splenectomy. In one patient, tumour was very small, located in the tail of pancreas, away from splenic hilar vessel and underwent spleen-preserving distal pancreatectomy. The mean operative time was 154 min which included operative time, monitoring and frozen section time and closure. The mean estimated blood loss was 35 ml (range, 20–100 ml). Three patients developed pancreatic ductal leak, two patients in enucleation group and one in distal pancreatectomy with splenectomy. Both patients in enucleation group had a minor leak (<30 ml/d) and responded to conservative treatment. One patient of laparoscopic distal pancreatectomy developed large collection (leak) and required ultrasound-guided pigtail drainage and had an extended stay. Insulinomas are rare neuroendocrine tumours of the pancreas with an incidence of 4 per million population. In 90% of the cases; they are single and are benign in 87%. Surgical enucleation and/or resection is the treatment of choice for solitary insulinomas., Enucleation is the preferred surgical procedure since it preserves normal pancreatic tissue and is associated with less morbidity. Resection procedures are usually reserved for suspected malignant tumours, tumours abutting the splenic pedicle and multiple tumours. Different types of resections include distal pancreatectomy with or without splenectomy, Whipple procedure, median pancreatectomy and subtotal pancreatectomy. In our series, two patients underwent distal pancreatectomy with splenectomy due to localisation of tumour near splenic hilar vessel. In one patient, tumour was very small, located in the tail of pancreas, away from splenic hilum underwent spleen-preserving distal pancreatectomy. In the earlier days, open exploration and enucleation was the treatment of choice. Intraoperative palpation of a hard nodule amidst soft pancreatic tissue was the hallmark in localising the tumour. In 1990, Gagner reported laparoscopic enucleation or resection of pancreatic insulinoma and since then various reports are published. Minimally invasive surgery by experienced laparoscopic surgeon offers advantage in successful surgical outcome. The available data on laparoscopic treatment of insulinoma highlight the usage of intraoperative ultrasound as a modality for optimum results,, which may not be available at all centres. In the present era of technology, it has become easier to localise neuroendocrine tumours. CECT scan (arterial phase), magnetic resonance imaging, DOTATATE scan, angiography and endoscopic ultrasonography are some of them.,,,,, CECT (thin multislice arterial phase) was the mainstay investigation. Insulinomas are hypervascular and hence hyperenhancing in arterial phase. In our series, CECT (arterial phase) was able to localise tumour in 17 patients. Daneshvar et al. have described a high sensitivity and specificity of this modality in localising insulinomas. In the rest (n = 2), EUS and DOTATE scan localised the tumour. We were, therefore, able to accurately localise insulinomas in all 19 cases preoperatively. In the enucleation group, pre-operative localisation and intraoperative laparoscopic finger palpation helped in localising all 16 patients successfully. One of the patients had superficial insulinoma and was easily located. In laparoscopy, lack of tactile perception may preclude surgeons from accurate judgement. However, with experience, the same 'touch and feel' perception improves. In a dedicated minimal access surgery unit with experience since 1994 of basic and advanced laparoscopic work, surgeons have developed the experience of this 'touch and feel' sensation in laparoscopic surgeries including the treatment of insulinomas. We have termed this palpation of insulinomas as 'laparoscopic finger palpation'. In the absence of IOUS, laparoscopic finger technique was helpful in detecting all deep-seated 15 tumours. IOUS is supposed to assist in intraoperative localisation. Meah et al. compared the palpation method with IOUS and reported palpatory method to be superior to IOUS in open surgery; Okabayashi et al. had a contrary view. Machado et al. in their study suggested 100% success by combining palpation and IOUS. Laliotis et al. have described the use of needle to mark the locale of the tumour with the help of IOUS to minimise pancreatic trauma. After enucleation/distal pancreatectomy, the blood sugars are expected to normalise within minutes after resection of tumour or may take 60 min. In our series, all patients were monitored for 45 min with serial sugar levels at 5, 15, 30 and 45 min. In the absence of dextrose infusion, maintenance of sugar within normal limits was taken as a successful outcome. All our patients had normal sugar after resection. Rushakoff et al. and Iwanaka et al. also in their study have reported similar result. Junginger et al. and Doi  have stated the value of frozen section in the treatment of insulinoma. In our series, we also did frozen section in all patients. A positive frozen section added a confirmation of diagnosis. There has been no recurrence in our series. A multidisciplinary approach involving laparoscopic palpation, frozen sections and intraoperative blood sugar monitoring helps laparoscopic management of solitary insulinomas without IOUS. We would like to thank the Dean, Seth G S Medical College and KEM Hospital, for allowing us to submit the Hospital data. Service FJ, McMahon MM, O'Brien PC, Ballard DJ. Functioning insulinoma – Incidence, recurrence, and long-term survival of patients: A 60-year study. Mayo Clin Proc 1991;66:711-9. Halfdanarson TR, Rubin J, Farnell MB, Grant CS, Petersen GM. Pancreatic endocrine neoplasms: Epidemiology and prognosis of pancreatic endocrine tumors. Endocr Relat Cancer 2008;15:409-27. Kinova MK. Diagnostics and treatment of insulinoma. Neoplasma 2015;62:692-704. Shin JJ, Gorden P, Libutti SK. Insulinoma: Pathophysiology, localization and management. Future Oncol 2010;6:229-37. Meah FA, Qureshi A, Jasmi AY, Rohaizak M, Faridah I, Khalid BA, et al. Pancreatic insulinomas – A study of 15 cases from 1978-98. Med J Malaysia 2000;55:242-5. Gagner M, Pomp A, Herrera MF. Early experience with laparoscopic resections of islet cell tumors. Surgery 1996;120:1051-4. Okabayashi T, Shima Y, Sumiyoshi T, Kozuki A, Ito S, Ogawa Y, et al. Diagnosis and management of insulinoma. World J Gastroenterol 2013;19:829-37. Machado MC, da Cunha JE, Jukemura J, Bacchella T, Penteado S, Abdo EE, et al. Insulinoma: Diagnostic strategies and surgical treatment. A 22-year experience. Hepatogastroenterology 2001;48:854-8. Daneshvar K, Grenacher L, Mehrabi A, Kauczor HU, Hallscheidt P. Preoperative tumor studies using MRI or CT in patients with clinically suspected insulinoma. Pancreatology 2011;11:487-94. Gouya H, Vignaux O, Augui J, Dousset B, Palazzo L, Louvel A, et al. CT, endoscopic sonography, and a combined protocol for preoperative evaluation of pancreatic insulinomas. AJR Am J Roentgenol 2003;181:987-92. Mehrabi A, Fischer L, Hafezi M, Dirlewanger A, Grenacher L, Diener MK, et al. A systematic review of localization, surgical treatment options, and outcome of insulinoma. Pancreas 2014;43:675-86. Sharma P, Arora S, Dhull VS, Naswa N, Kumar R, Ammini AC, et al. Evaluation of (68) Ga-DOTANOC PET/CT imaging in a large exclusive population of pancreatic neuroendocrine tumors. Abdom Imaging 2015;40:299-309. Fernández-Cruz L, Cesar-Borges G. Laparoscopic strategies for resection of insulinomas. J Gastrointest Surg 2006;10:752-60. Laliotis A, Martin J, Worthington TR, Marshall M, Isla AM. 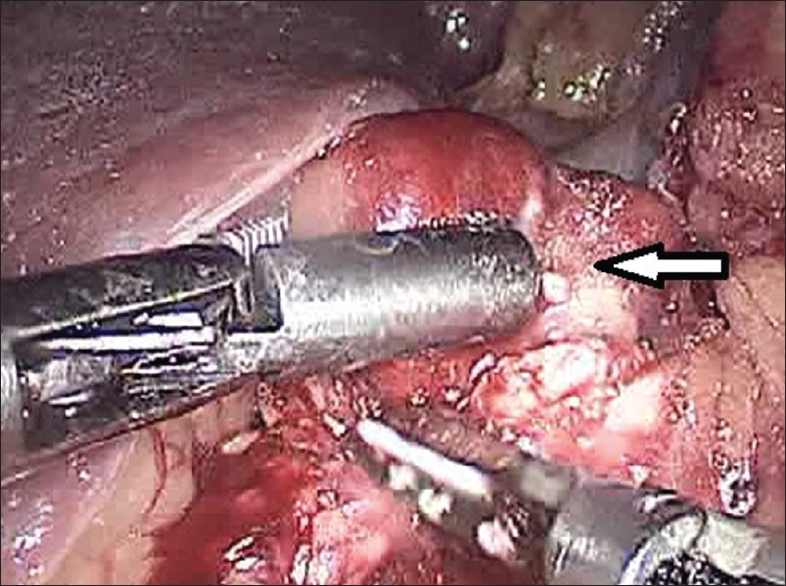 A novel technique of needle-guided laparoscopic enucleation of insulinomas. Surg Laparosc Endosc Percutan Tech 2015;25:e24-6. Rushakoff RJ, Siperstein A, Clark OH. Insulinoma and other hypoglycemias. In: De Groot LJ, Chrousos G, Dungan K, Grossman A, Hershman JM, Koch C, et al., editors. Endotext. South Dartmouth, MA: MDText.com, Inc.; 2000-2009. Iwanaka T, Matsumoto M, Yoshikawa Y, Koda N, Mochizuki H, Aihara T, et al. Accurate localization of an insulinoma by preoperative selective intra-arterial calcium injection and intraoperative glucose monitoring. Pediatr Surg Int 2000;16:118-20. Junginger T, Böttger T, Beyer J, Weber W. Surgical therapy of insulinoma. Chirurg 1990;61:643-6. Doi R. Determinants of surgical resection for pancreatic neuroendocrine tumors. J Hepatobiliary Pancreat Sci 2015;22:610-7.